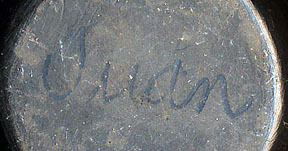 Juan Tafoya(d) was born in 1949 and has been making pottery since 1970. 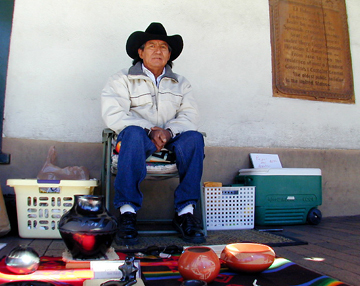 He gathers the clay from the San Ildefonso Reservation and fires his pottery outdoors. 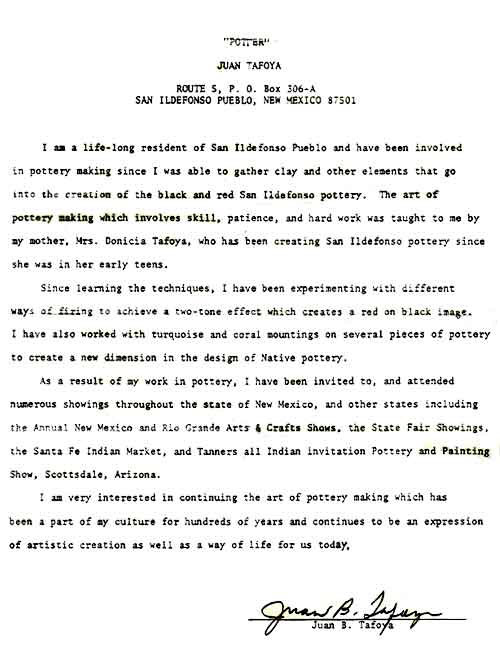 Juan has a personal statement about himself as follows: I am a life long resident of the San Ildefonso Pueblo and have been involved in pottery making since I was able to gather clay and other elements that go into the creation of the black and red San Ildefonso pottery. The art of pottery making which involves skill, patience, and hard work was taught to me by my mother, Mrs. Donicio Tafoya, who has been creating San Ildefonso pottery since she was in her early teens. Since learning the techniques, I have been experimenting with different ways of firing to achieve a two-tone effect which creates a red on black image. I also have worked with turquoise and coral mountings on several places of pottery to create a new dimension in the design of native pottery. 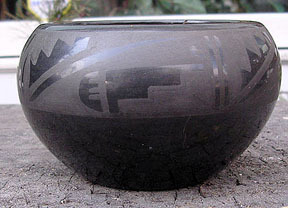 As a result of my work in pottery, I have been invited to, and attended numerous showings throughout the State of New Mexico and other states including the Annual New Mexico Arts & Crafts Show, Eight Northern Pueblos Arts & Crafts Show, the State Fair showings, the Santa Fe Indian Market, Renwick Gallery and the Smithsonian Institution. I am very interested in continuing the art of pottery making which has been a part of my culture for hundreds of years and continues to be an expression of artistic creation as well as a way of life for us today.